Preheat oven to 400 degrees. Microwave spaghetti squash for 9 minutes in 3 minute intervals to soften. Slice the ends off and stand squash upright. Cut in half down through the center. Scoop out seeds making sure not to scoop out any of the squash. Place squash in a foil lined baking sheet. Make an additional foil cradle and place under the squash for stability. For each half squash, sprinkle with a little pepper. Spread 1 cup of shredded cheese into the cavity. Sprinkle minced garlic over cheese. Pour half and half over garlic and cheese. Sprinkle remaining half cup of white shredded cheese over top. 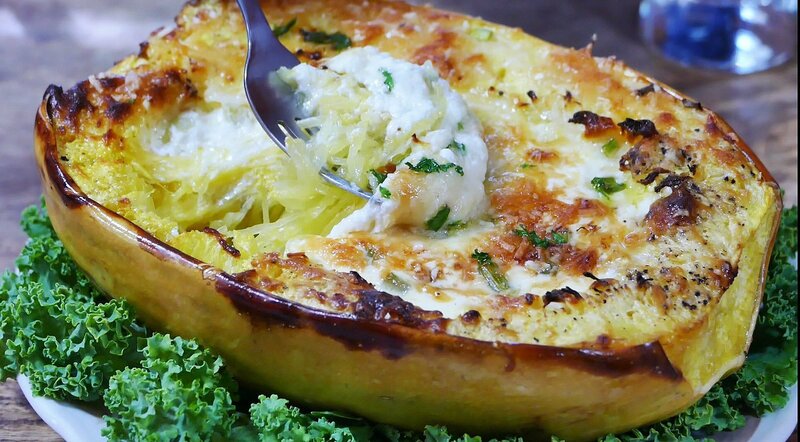 Finish by spreading 1 cup of Parmesan cheese over squash, and sprinkling a little around the rim of the squash. Place in the oven and cook for about 1 hour or until cheese and cream make a rich creamy sauce. If top becomes too brown, cover with tin foil. Serve immediately. Preheat oven to 400 degrees. Microwave spaghetti squash for 9 minutes in 3 minute intervals to soften. Slice the ends off and stand squash upright. Cut in half down through the center. Scoop out seeds making sure not to scoop out any of the squash. Place squash in a foil lined baking sheet. Make an additional foil cradle and place under the squash for stability. Prepare your favorite homemade or store bought pasta or meat sauce. Brush squash with olive oil, including the rim. Sprinkle cavity with one cup mozzarella or Italian blend shredded cheese. Spoon 1 1/2 to 2 cups pasta sauce into the cavity. (Depending on the size of the cavity.) Spread remaining cup mozzarella or Italian blend cheese over top of pasta sauce. Top with 1/2 fresh grated Parmesan cheese, sprinkling a little around the rim. Place in the oven and cook for about 1 hour or until squash has softened. If top becomes too brown, cover with tin foil. Serve immediately.